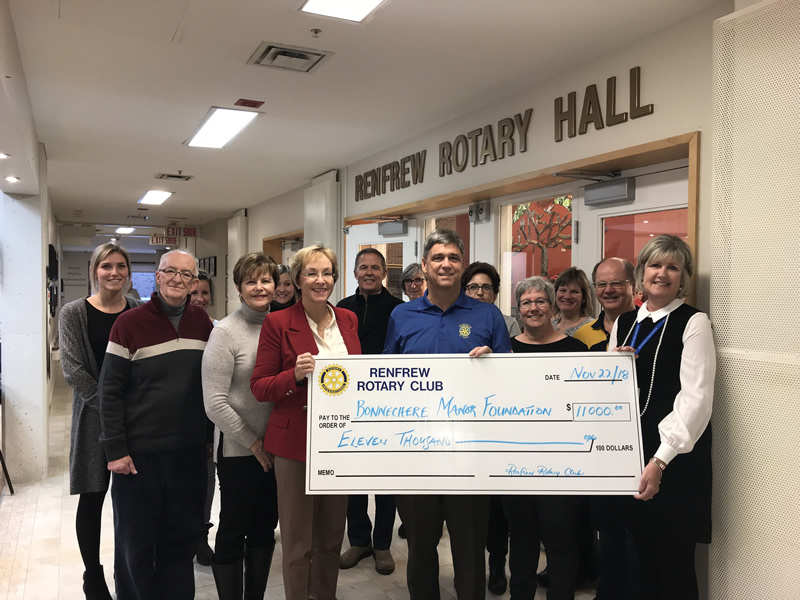 Renfrew Rotary Club Fulfills Its' $100,000 Pledge For Bonnechere Manor's "Renfrew Rotary Hall"
The new Bonnechere Manor Long-Term Care Home opened in 1995 replacing the original facility which opened in 1958. While the provincial government provides some capital funding for nursing homes; this does not include funding for auditoriums. The residents sorely missed having a large enough gathering place where for the residents and their guests to get together for entertainment, Christmas dinners and so on. A decision was made, supported by the County of Renfrew based on strong advocacy from the Bonnechere Manor Foundation, to add an auditorium to the building. A successful fundraising campaign was completed by the Foundation. That’s when the Renfrew Rotary Club stepped up to make a $100,000 pledge over 10 years which included the naming rights of “Renfrew Rotary Hall”. Don Goulet, Chair of the Bonnechere Manor Foundation, noted that with this final installment, the service club is well ahead of its pledge target of $100,000 over a 10-year period. "It has only been eight years since the Renfrew Rotary Club made this pledge and it’s a great way to finish the Manor’s 60th Anniversary celebrations this year.” Mr. Goulet added that the Foundation is indebted to the Rotary Club and the many other Renfrew and area people and businesses that made this much needed dream a reality. Shelley Sheedy, Director of Long-Term Care for both of the County of Renfrew Homes, expressed her gratitude on behalf of the residents, staff and the community to the Rotary Club of Renfrew for making this well used space possible. The auditorium allows for a large variety of activities to take place, many of which would not happen without this versatile location. "The residents use the auditorium every day," said Mrs. Sheedy - “residents’ activities such as exercise classes, bingos, art classes, indoor bowling, pizza parties, musical entertainment and movies.The room is also used for staff education purposes, meetings and appreciation events.” Community activities such as the Home’s annual volunteer appreciation dinner and fundraising initiatives such as the recent successful “Women Who Work” event and the Foundation’s annual Gala mean some of the very people who made the auditorium possible, are also able to enjoy the beautiful addition. It can also be rented at a very reasonable cost. Pictured below is Renfrew Rotary Club President John Wilson, along with fellow Rotarians, presenting the final cheque to Bonnechere Manor Foundation Treasurer Sheila Kemp and Director of Long-Term Care Shelley Sheedy and other members of the Foundation. Bonnechere Manor, a highly regarded long-term care home in Renfrew, Ontario, is a municipal (not-for-profit) Home owned and operated by the County of Renfrew and City of Pembroke. Since 1958, a wide-range of quality long-term programs and services including 24 hour nursing care, accommodation, meals, as well as physiotherapy programs and a variety of social and recreational activities have been provided to the 180 residents that call the Manor ‘home’. Bonnechere Manor also offers a variety of community services such as respite care, an adult day program in Cobden and Renfrew, and a Parkinson’s support group. Bonnechere Manor holds accreditation with Accreditation Canada which provides the Home with the opportunity to benchmark their programs and services to national standards and assists in continuous quality improvements.